What about you? I am having serious problems with Mosquitos, every year but this time I am more aware as I don´t want them to bite my little boy. Once they bit him 9 times in the face and he looked liked he was ill, apart of that it must be so annoying to have an itchy face and not been able to scratch it. 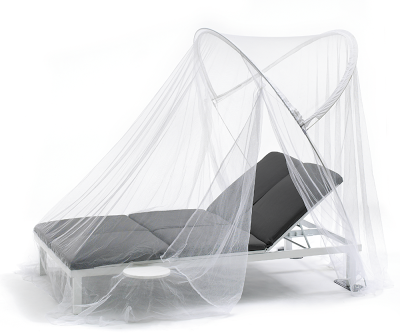 I was on the hunt for 2 Mosquito nets, I got one for Matt´s room but was still in need for our bed as well. I really wasn´t too happy about the fact to drill a hole in the ceiling to hang the Mosquito net from there. We have a ceiling fan... a pretty one, silver and minimalistic. ( I am aware that ceiling fans are a design NONO, but it´s so practical in a house without AC.) 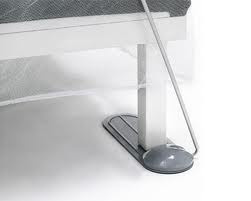 So I was thrilled to have found a Design Mosquito net called DBug, that doesn´t require drilling a hole in the ceiling. I hope to receive it by mail any time soon so we can sleep buzzz free.